The current exhibit at the New York Public Library is entitled The ABC of It: Why Children’s Books Matter (through September 7, 2014). The show explores 300 years of best-loved children’s books. My favorite display is of the original Pooh, Piglet, Eeyore, Kanga, Roo, and Tigger stuffed animals that A.A. Milne memorialized in the tales of Winnie-the-Pooh. Other exhibits are equally nostalgia-inducing: a cow jumping over the moon, Alice making her way through her Wonderland, Mary, Dickon and Colin romping in Frances Hodgson Burnett’s Secret Garden, and Maurice Sendak’s Max exploring an island filled with scary-looking Wild Things. 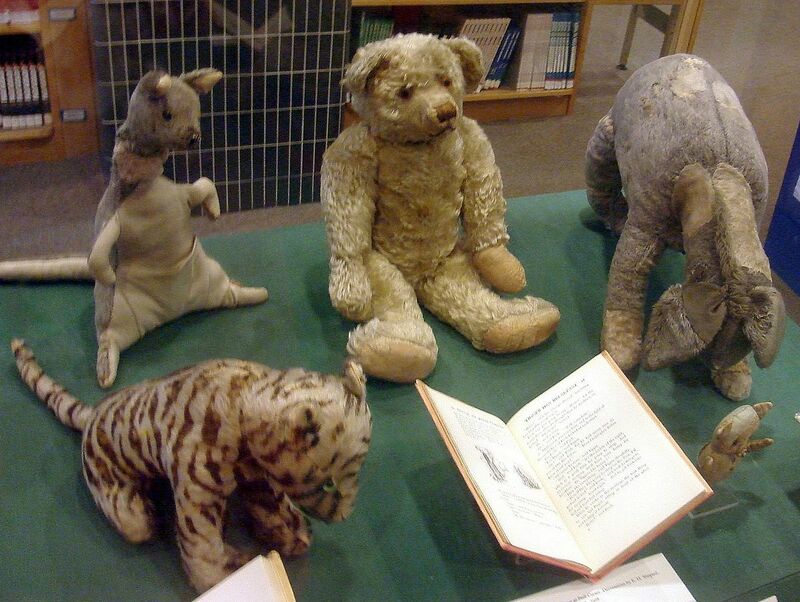 Winnie-the-Pooh and friends, on display at the New York Public Library. Since their creation, many of these characters have assumed lives of their own. They also forged international bonds whose effectiveness surpasses even those painfully established by politicians. For me certain books tied my nursery, which stood in Germany, to that of my American-born children. Pooh never vanished from my memory, but I had forgotten all about the wondrous Mary Poppins and remembered her only when I read her story to Judy and David. Television characters, including the hard-working Big Bird and Kermit the Frog, populate the minds of the last two generations, though I hope that they won’t supplant those encountered in books. As a child I treasured my little library – at one point it numbered sixty books! Not all parents can provide their children with books. To remedy the situation, singer-songwriter Dolly Parton started the Imagination Library in her native Tennessee in 1996. It provides children from zero to five years with free books. The program was such a success that by now the Dolly Parton Foundation and its partners have provided a total of forty million books to participating families in the United States and Britain. Inspired by Dolly Parton, the Harold Grinspoon Foundation (HGF) founded its PJ (stands for pajama) Library in 2005. Recently the Library distributed its five millionth free book to parents who want to teach Jewish values to their children six months to eight years of age. To subscribe, visit www.pjlibrary.org. In 2009, HGF founded Sifriyat Pijama in Israel. Since then the program has distributed 215,000 books to preschool and kindergarten children attending local schools. Again, as in the case of the Imagination Library, the books reached children for whom it was the first book they owned. In 2013, the HGF undertook an almost impossible task: provide Israel’s Arab preschoolers with free books. The hero of Maktabat al-Fanoos‘s debut book introduces Sumsum, a storytelling mouse, who slacks off during the food-gathering season but pulls his weight amusing others during the dank winter months. The program is a big success. During its first months it reached over 49,000 children. Who knows, perhaps Sumsum and his Jewish counterparts will succeed in fording the war-torn gulfs that no one has been able to bridge during the past sixty-five years. This entry was posted in Uncategorized and tagged aa milne, children's books, dolly parton, harold grinspoon foundation, imagination library, israel, maktabat al-fanoos, middle east, middle east conflict, new york public library, ny public library, nypl, pj library, sifriyat pijama, winnie the pooh. Bookmark the permalink.